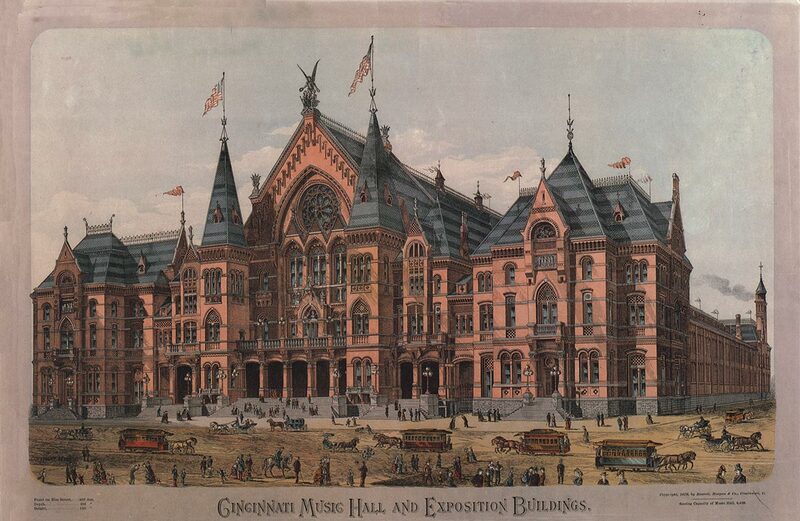 ''The new Cincinnati Music Hall, of which we present an engraving as it will appear when the proposed additions on each side are completed, is the splendid result of the popular enthusiasm awakened by the musical festivals of 1873-75. The enterprise received its first practical impetus from a liberal-minded citizen of Cincinnati, Mr. Reuben R. Springer, who, in May, 1875, offered to give $125,000 for the purpose of building a Music Hall, on two conditions: the first, that the lot on Elm Street, corner of fourteenth, be secured from the city for the perpetual use of a society to be formed for the purpose, at a nominal rent and free from taxation; and the second, that a further sum of not less than $125,000 be subscribed by the citizens. ''This liberal offer excited much enthusiasm, and committees were at once formed to encourage and receive subscriptions. A little later Mr. Springer offered to increase his subscription $50,000, as soon the citizens had raised $125,000, on condition that they should agree to raise an additional $100,000; and later still he offered $20,000 more, on condition that $15,000 be raised within thirty days to make up the amount then subscribed by the citizens to the sum of $105,000. Under the impulse of these very generous offers the subscriptions came in rapidly, and the requisite amount was finally obtained. ''The Music Hall which forms the center of the noble pile of buildings shown in our engraving, is now complete, and ready for the May Musical Festival. The style is a modified, modernized Gothic; the material bright-colored pressed brick, with sunken joints; the ornaments of stone, tile and colored brick. The arrangement by the architect is to show a group rather than a single building, as the space between the main hall and the side buildings is only twelve feet in front. The front of the whole pile on Elm Street will he 372 feet 4 inches, 90 feet being given to each of the Exposition buildings, and 178 feet 4 inches to the Music Hall. The depth of the buildings from Elm Street to Plum is 293 feet. The highest point in the pile will be the pinnacle of the front gable of the Music Hall, which is 150 feet above the sidewalk. The arrangement is such as to admit of the use of the buildings separately or together, the upper stories to be connected by bridges. The facade on Elm Street is three stories high, on Plum Street two stories; the central portion, however, which is planned to be covered with a glass roof, is 30 feet wide and one story high. In the three-story elevations are located three picture-galleries, with a wall surface of 580 feet, planned after the galleries in the South Kensington Museum. ''The front approach to the Music Hall is by stone steps to a stone platform 12 feet wide, and extending along the whole front, except where interrupted by two towers. Between these towers five doorways 11 feet 4 inches wide give access to the grand vestibule, 46 by 112 feet, and 41 feet high, broken by a gallery at the height of 21 feet 8 inches, running around it so as to leave a well-hole 39 by 68 feet. Above this vestibule is a small hall 46 by 112 feet, and 30 feet high. Back of the vestibule is the main hall, 112 feet broad by 192 feet long. The stage space is 112 by 56 feet. It will accommodate a chorus of 560 voices and a relatively sized orchestra. A gallery runs along both sides and over a narrow portion of the rear of the hall, at a height of 21 feet 8 inches. ''Along each side of the vestibule and of the main hall runs an 18-feet corridor, unbroken by any steps, and having independent exits. The vestibule opens into this corridor with arched doorways, and into the hall with ordinary but wide doors. Alongside of these corridors at each corner of the building run stairway corridors for the necessary distance. The stairs are all straight, built of iron and stone. Those at the rear are nine and those at the front nearly twelve feet wide, or eight inches wider than the main entrance at Pike's Hall. These stairways have also their own direct exits, so that there are nine doorways in the front. In the rear of the building on the ground-floor are two rooms 20 by 27 feet, and above them and over the corridors are two similar rooms, and two 27 by 26 feet 6 inches. Back of the organ space is a passage on both floors 11 by 56 feet. ''In the front tower are eight rooms 14 feet 3 inches by 19 feet 5 inches. The two on the ground floor are intended as ticket offices. In the front of the building are also two rooms in the first and two in the second story, over the corridors, 31 feet 6 inches by 26 feet eight inches. ''The organ in this Music Hall is one of the largest and finest in the world, and it is interesting to know that the elaborate and beautiful wood-carving with which it is adorned was entirely done by Cincinnati ladies, whose specimens of wood carving excited so much admiration at the Centennial Exhibition.